In 2009, the U.S. unemployment rate approached ten percent. Today, when new work is found, it may not be traditional. Studies estimate half of the American workforce will soon consist of freelancers, consultants, independent contractors, entreprenuers, "electronic immigrants," and so forth. Are you ready for the new normal? Dan Miller has seen it coming for years. 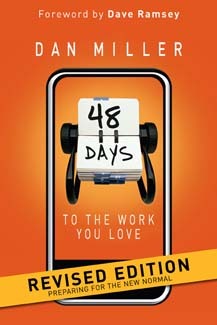 But his thriving vocational best seller, 48 Days to the Work You Love, is not so much about finding a new job as it is learning about who we are really called to be in relation to our vocation-whatever shape that career may take in these changing times. According to the author, failing to make that fundamental discovery of calling is why so many people find themselves in jobs they hate. But now, thousands upon thousands are finding the work they love, thanks to practical advice from this leading career counselor. Conversational and creative, Miller helps the reader understand one's Godgiven skills and abilities, personality traits, values, dreams, and passions. Doing so helps us recognize clear patterns that will point toward successful decisions along the career path. Step by step, this updated edition of 48 Days to the Work You Love reveals the process for creating a Life Plan and translating that plan into meaningful and fulfilling daily work. Let the countdown begin! Dan Miller is president of 48 Days LLC, specializing in creative thinking for increased personal and business success. He holds a master's degree in psychology and draws from his business experience to help others develop more focused, balanced, truly successful lives. Dan and his wife live in Franklin, Tennessee.